Eammon finished in 15th place with 826 points out of 232 riders. The winner finished with 959 points. Well done for Eammon, showing great consistency over a range of different courses. Lakes RC finished in 13th place out of 37 clubs. Thanks to Graham Carrick, Emma Yates, Dave Nicholl and Paul Maxwell for contributing to the team total. See if we can get higher up the table next year! The final event of the season, in near perfect conditions, saw Eammon complete his 8 races in a time of 28.01 14th out of the 30 riders. Eammon Quinn and Emma Yates both competed in this 25 mile TT on 2nd June. Eammon rode the course in a time of 1.04.51 and Emma in a time of 1.16.37. I would think the conditions would have been warmer than her last TT. Well done to both riders. This puts the club in 13th place and Eammon in 15th out of 220 riders so far. Eammon Quinn and Emma Yates competed in the Wigan Wheelers 30. Eammon quoted ‘Those were the coldest conditions I have ever raced in!’ It must have been cold as the results have still not been added to the official list! Well done to Emma as this was her first TT. What a way to start! Eammon was our only rider in the Rossendale 25 posting a great time of 1:02:03. This puts the club in 14th pace with Eammon in 13th place overall. Keep up the good work! Three Lakes riders have been competing in this hilly series of time trials this season. 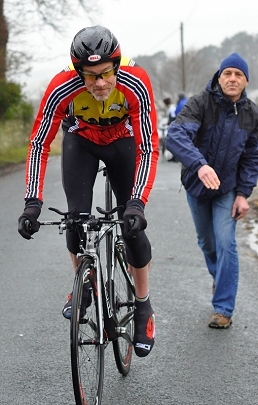 Two riders, Dave Nicholl and Paul Maxwell posted times of 30.28 and 32.20 in the first race of the season back in March. Eammon Quinn has been the clubs most consistent rider attending 4 events so far and is currently sitting 14th in the table. Lakes currently stand 14th in the table.